A firm possessing market power faces a downward-sloping demand curve. An important consequence of the firm's market power is that its marginal revenue is less than price. If the firm produces in the short run, the profit-maximizing output is found where marginal cost equals marginal revenue. 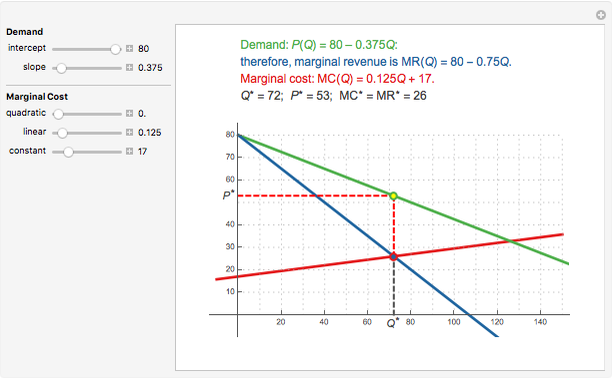 This Demonstration shows a linear demand curve (green), its associated marginal revenue curve (blue), and the firm's marginal cost curve (red); mouse over the curves to identify them. The point where the marginal revenue and marginal cost curves intersect is identified as well as the point the firm uses to set the profit-maximizing price; mouse over these points to identify them. 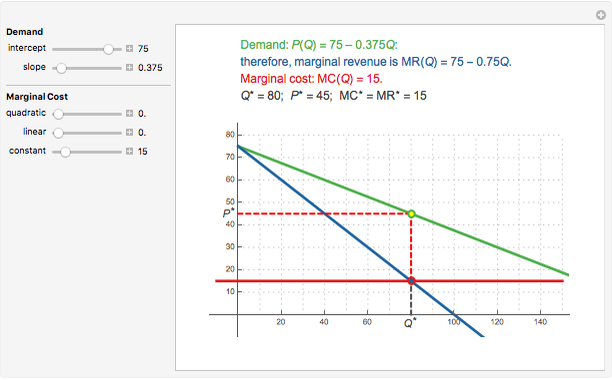 This Demonstration lets you change the parameters that define the linear demand curve (and, therefore, the marginal revenue) and the marginal cost. You can track the two points where determines the profit-maximizing output and the point on the demand curve that determines the profit-maximizing price for the seller to charge. 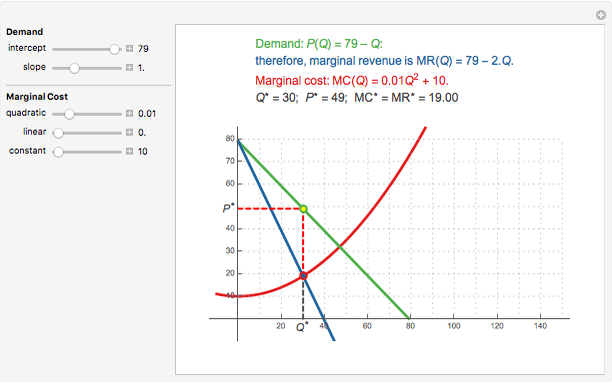 The snapshots show that the Demonstration accommodates three "shapes" for marginal cost. Thomas Mitchell "Monopoly Profit-Maximization with Quadratic Marginal Cost"
How Much Should I Reinvest in a Business?